Today’s news review looks at the coverage of data published on schools, pupils and their characteristics for 2016. Yesterday, we published statistics on schools, pupils and their characteristics. These are published annually and include data on pupil numbers, changes to class sizes and the number of schools. The Times , Telegraph and Daily Mail have all covered the release of the statistics. The Times and Telegraph focus on the small rise in the number of primary school pupils and speculate that this is because of immigration. The Daily Mail leads with the increase in the number of so called ‘titan schools’ – schools with more than 800 pupils – and also implies that this is due to an increase in children from migrant families. It is wrong to suggest that larger schools are worse off. What the Mail’s story fails to recognise is that a large school does not mean larger class sizes. The vast majority of primary schools with over 800 pupils (nearly 90%) are Good or Outstanding. Coverage also fails to reference the significant investment the government is providing to help create more good school places. Delivering good quality school places is a top priority for this government and the latest figures show that the system continues to work. 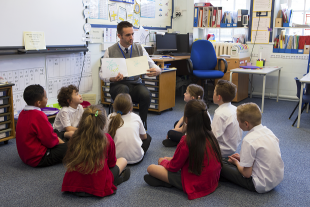 Today’s figures reveal thousands fewer children are being taught in large infant classes. The data also shows that primary school class sizes remain stable at 27.1 pupils. The government has already committed £7 billion for school places, which along with our investment in 500 new free schools we expect to deliver 600,000 new places by 2021. Read the Written Ministerial Statement that provides more detail on the significant investment we are providing for more good school places.